Supergirl's soaring third season experiences some unexpected turbulence as it enters its final stretch. Warning: This contains spoilers. For how to watch Supergirl, click here. Supergirl’s soaring third season hits some unfortunate turbulence in its final stretch, as Episode 20 and 21 take an extremely bump ride towards a destination that’s not all that thrilling. The double-bill is joined by the exciting cliffhanger of Supergirl and Reign exchanging punches once more – and the fact that it still manages to mess up the flight path around that is a tad concerning, after the strong writing that’s defined this season. We kick off with someone attempting to take out Alex – that, dear readers, is something we’re not okay with – and she and Winn promptly start to investigate the culprit. It appears to be Ron Collins, the sheriff from Midvale and the first person she ever arrested (back when was a teenager – Alex is an early-achiever). Now out on parole, he’s only a few blocks from her, and surely has the motivation to do it. And so she confronts him in a bar, where he tells her he’s not got a grudge – and, before you can say the words “red herring” and “alibi”, her motorbike outside suddenly explodes, leading to a frantic rooftop chase between Alex and her assailant. If that all sounds like padding, it at least gives us a chance to see Alex’s deputy babysitter at work. Yes, it’s Winn. And yes, he’s as terrible with Ruby as you’d expect, complaining at her that he’s unable to sleep. Neither is she, she points out, what with her mother being a Worldkiller and all. Way to go, Winn – although it does lead to them bonding over a shared experience of parents who have turned out to try and murder them. It goes down as one of the least likely bonding conversations you’ll see on TV this year – and yet the cast make it somehow work. So far, so good, you think, as the writers continue to tie together Winn and the other threads of the plot into a neat whole. But things so go off the rails, as we catch up with Kara and Mon-El, who fly in their space car to what turns out to be Argo City. It’s Kara’s hometown! And her mother’s alive! And look, there’s the flower Kara had in her childhood bedroom! If this all sounds too suspicious to be true, you’d be right. But first, we spend some time with Kara and Mon-El as they look around the place. 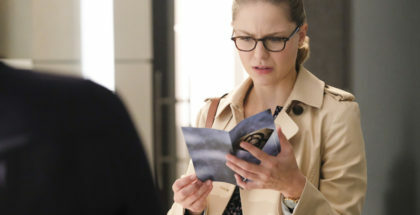 On the plus side, that means Melissa Benoist getting a chance to play happy, in a season that’s been notably darker than normal – and some cute scenes of reunion with her mother and other Kryptonians. Even better, though, is the chance to see Mon-El save a young kid in the local market by giving him a Brainy gadget that will cure his lung disease – a nice selfless act that he carries out while wearing a cloak. Mon-El is the man we all want to be. Kara and Mon-El are there, of course, to get a magical black rock (Harun-El) so they can destroy Reign. 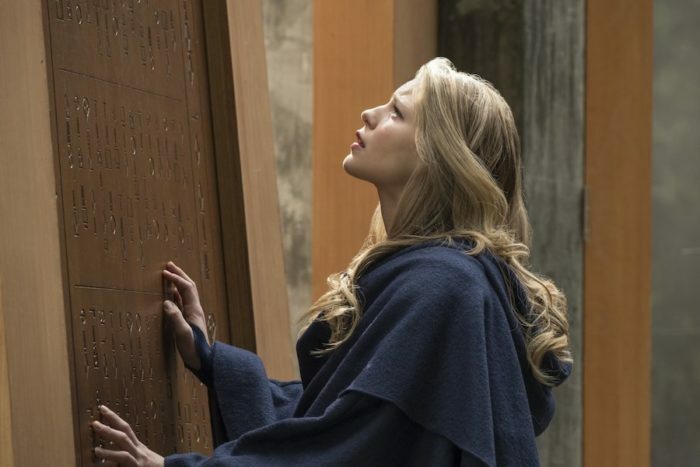 It turns out that rock is what has made the domed city (the dome protected them from Krypton’s destruction, apparently – think the reverse Under the Dome) hospitable, but the city’s High Council nonetheless vote to allow Kara to borrow some. That vote is swung by Serena, an extremely sinister-looking member of the council, who you may recognise from Reign’s visions as a Bad Person. More on that later, because Supergirl and Mon-El first have to rush back to National City to use the rock to stop Reign. Entering the lab just as Reign breaks free from her prison (Lena flooding her with kryptonite does nothing, after Reign has been getting stronger and adapting to resist it), a bout of fisticuffs erupts – and, after the cliffhanger, we see Lena calmly turn the magic rock into magic black liquid that they inject into Reign’s neck using a magic syringe. A brief bit of CGI later and Reign splits from Sam’s body, and bursts into glowing ash mid-air. Bye bye, Reign. To say it’s an underwhelming resolution is an understatement, as Supergirl all too easily dispatches the most intimidating foe the programme has ever seen. And it’s that oddly clunky pacing that typifies what goes awry with this double-bill. It only goes to highlight how disjointed Alex’s storyline feels, as she and J’onn track down her assassin. They turn out to be… an alien from Fort Rozz. So much for someone with an interesting, personal grudge. Alex, instead, gets the time to ponder whether the half of her who’s prepared to leap off buildings to apprehend criminals and the half of her who wants to be a mother can ever co-exist. 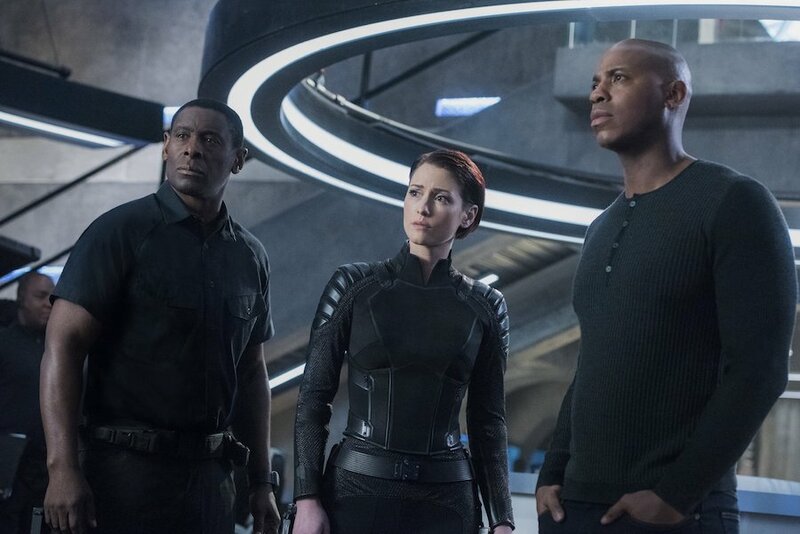 We’re all for Chyler Leigh getting some thoughtful character beats, but it’s crammed into a quick scene after an episode full of stuffing – Kara’s plea to the High Council that there are humans worthy of saving, who help her fight aliens on Earth, isn’t enough to hold the episode together. What to do now that Reign is dead? Supergirl has fun with the idea, as we see Winn and James getting bored with no real criminals or danger to fight – James is playing basketball by himself in his Guardian outfit, in one of the cutest scenes yet. The silence is soon disrupted, though, by someone trying to shoot people with a DEO-style gun. Cue James and J’onn investigating where the weapon came from, leading them to the same company that arms the DEO. “Our guns brings families together,” argues the CEO. And before you can say “socially aware dilemma of the week”, James is lecturing J’onn about the dangers of firearms, while J’onn defends arming the DEO with guns. Then, James has a debate with Lena about it, in which he realises that she carries a gun with her for safety. These are important discussions and Supergirl’s strength partly lies in the way it fuses comic book action with a social conscience and heartfelt engagement with big issues. But like Alex’s storyline before it, Episode 22 just feels like it’s rushing the topic, cramming it in for some dramatic padding – Lena and James’ conversation, for example, ends within 30 seconds, as they agree to disagree and start chowing down on some pizza. It’s the kind of falling out that could have been stretched out over several episodes, really digging into the nuances of each perspective. As it is, we may never hear either character’s view again – by the end of the episode, James and J’onn have tracked the shooter to a former employer looking for revenge against his old company. J’onn talks him down with a passionate plea for changing his life into something positive, before deciding to disarm the DEO’s gun arsenal in favour of non-lethal weapons. Again, a great message, but one that feels out of place. Why? 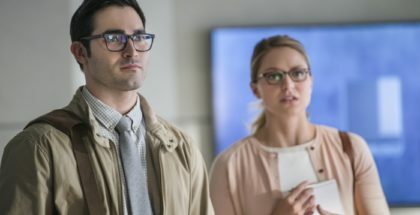 Because Supergirl is flapping in the wind without an antagonist to anchor it – in a season that has been framed around the rise of Reign, it’s a jarring shift that even the strength of its supporting cast can’t entirely mask. 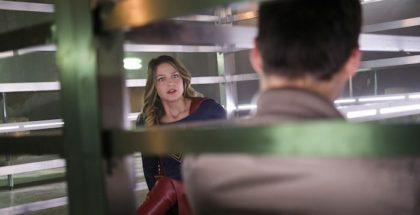 It doesn’t help that when we hop back to Argo City, things start to try and kill Kara and Mon-El – a threat that leads them to uncover that yes, Serena, is a Bad Person. In fact, she’s working with a group of cloaked baddies (the Children of Juru), all of whom seem to be connected to Reign. Calling herself a High Priestess, she steals Kara’s ship and leaves for Earth, after burning the Worldkiller emblem into the grass. Lawn mutilation and grand theft auto? It’d be a cool introduction of a villain, if it weren’t so hurried. It also leaves us back in, essentially, the same place we were before: why kill off Reign, only to introduce someone who is basically the same person trying to presumably do the same thing? This twist is meant to be heart-wrenching counterpoint to Supergirl’s blissful homecoming – she has a farewell party with her Earth friends, saying that she wants to go stay on Argo City for the immediate future and look after herself for a bit. But with several episodes left in the season, we know that farewell isn’t going to happen, which leaves you wondering what the point is. Part of the point is getting to see Mon-El and Kara send some more sparks into the romantic air – although Kara literally saying that a sweet glimpse of them both dressed in white in a green field is like a dream she had earlier this season undoes a lot of the atmosphere. The result is a double-bill that has some positive moments, and continues to boast an excellent cast, but after a season that has laid its groundwork so carefully, it’s unexpected to see things fall apart so suddenly. As Episode 21 closes, Serena lands back on Earth, where Thomas Coville (of course) is waiting – and a fortress springs out of the ground, thanks to a Kryptonian crystal. Miles away, Sam (who’s back with Ruby) freezes and seems to relapse. Killing off Reign to bring in an identical villain, only to resurrect Reign once more? Here’s hoping Supergirl can get back on track in its final few hours. 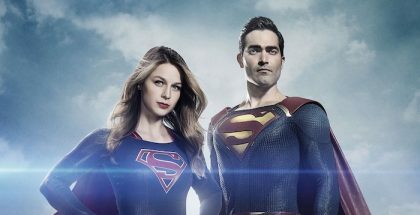 Supergirl Season 3 is available on Sky 1 every Monday at 8pm. Don’t have Sky? You can stream it live or catch up on-demand through NOW TV, as part of a £7.99 monthly subscription, no contract. A 7-day free trial is available for new subscribers.